The Notre Dame QuarkNet Center was featured as the cover story in the November issue of Optics and Photonics News, a major journal for scientists and engineers in the field of photonics. QuarkNet is a national education and outreach program that partners high school teachers and students with particle physicists. 105 Jordan Hall of Science was packed with mostly underclassmen for the Undergraduate Research Internship Information Night (UGRIIN) on November 4. Eager to learn about the research opportunities available to them, the science students attended the event which was co-sponsored by the College of Science and the Notre Dame Biology Club. After an introduction by Professor T. Mark Olsen, attendees listened to presentations by Laura Flynn of the Career Center and five Notre Dame students who have participated in a variety of different research projects. 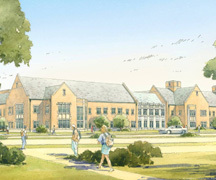 A groundbreaking ceremony for Harper Hall, the new home of expanded medical and cancer research initiatives at the Indiana University School of Medicine-South Bend (IUSM-SB) and the University of Notre Dame, will be held at 10 a.m. Friday (Nov. 21) at a site adjacent to Raclin-Carmichael Hall on the corner of Angela Boulevard and Notre Dame Avenue. 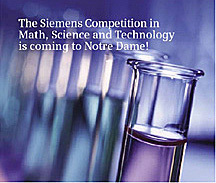 Five individuals and five teams of high school students have been selected to compete Friday and Saturday (Nov. 7 and 8) at the University of Notre Dame in the regional of the Siemens Competition in Math, Science and Technology, the nation’s premier science research competition for high school students. Laura A. Banaszynski, who earned her undergraduate degree in chemistry at Notre Dame in 2000, has won the 2009 Nobel Laureate Signature Award for Graduate Education in Chemistry from the American Chemical Society for her work with Dr. Thomas J. Wandless at Stanford University. The award, sponsored by Mallinckrodt Baker Inc. and approved by the Nobel Foundation, includes a plaque signed by Nobel laureates and a $3,000 honorarium for the student and another $3,000 for the advisor. Only one is granted each year. S. Alex Kandel, now a professor of chemistry and biochemistry, won the award in 2000.